This is the first time I’m doing a terrained base of any kind so like all 21st Century nerd, I went to Youtube to get learn how to do it. I found the EonsOfBattle channel which offered easily followed tips. 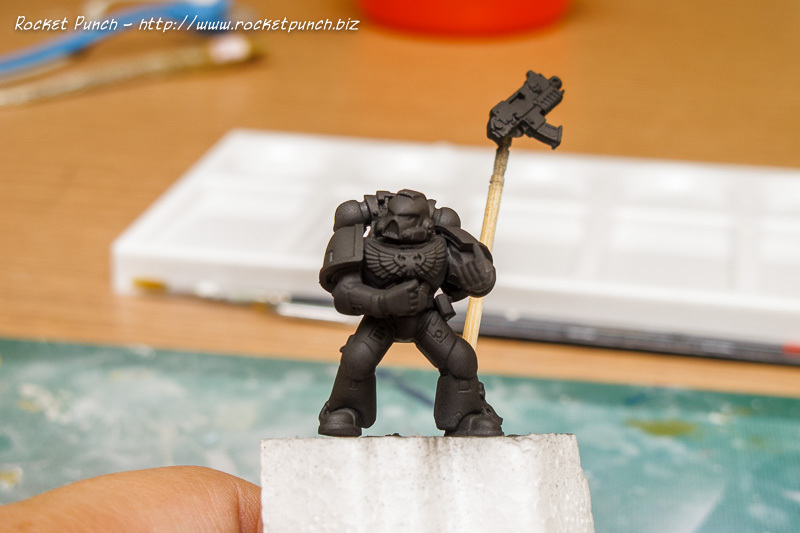 So first I fixed the base onto a block of styrofoam so it’s easy to hold (pic 1). Then I put on some glue from a hot glue gun to build up a bit of uneven groundwork. I glued 2 small stones I picked up from the street and some foam bricks with the glue gun to simulate a pile of bricks. After the glue has dried I brushed white glue on all the remaining spaces and added sand (pic 2). 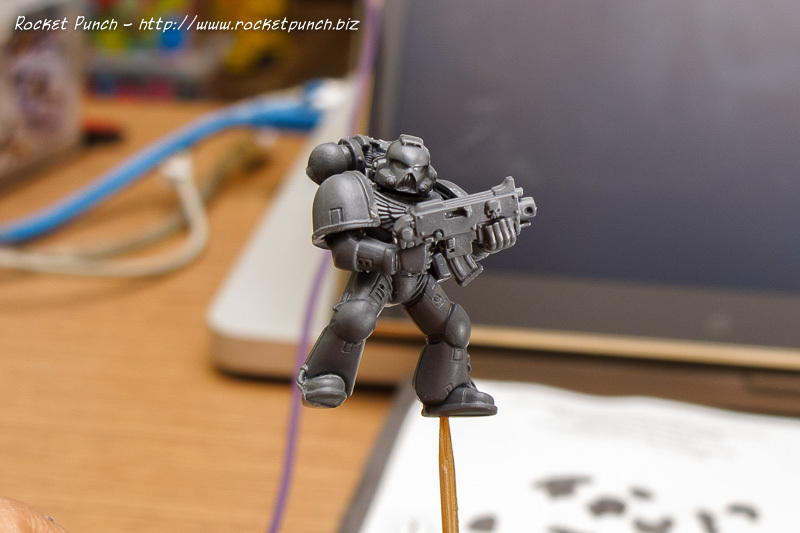 Then it was a coat of Vallejo Model Air Black Grey as a base color (pic 3). 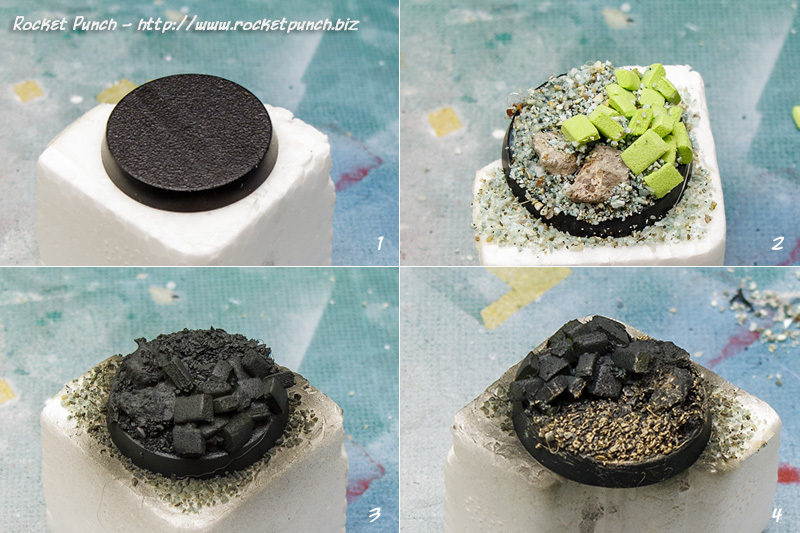 After that has dried I drybrushed Model Color Iraqi Sand on the erâ€¦ sand. This was also given a wash from Model Color Wash Brown (pic 4). 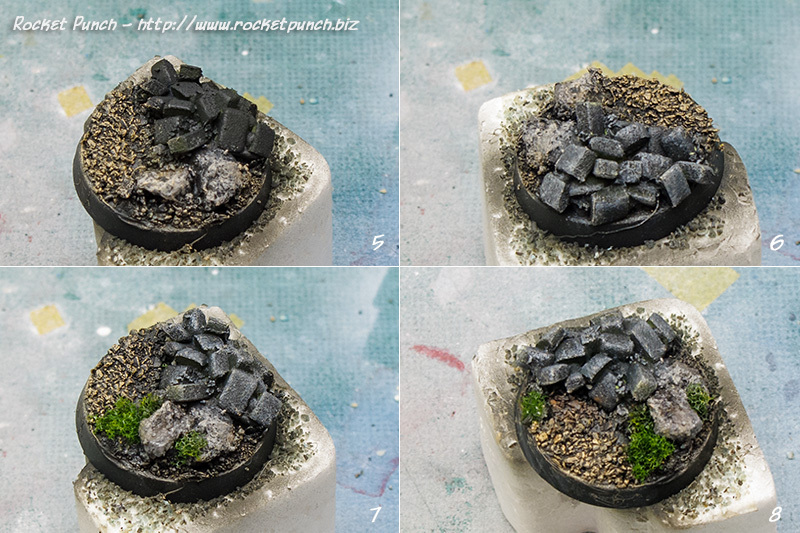 I then drybrushed the stones with Model Color Medium Sea Grey and Light Grey to bring out details (pic 5). For the bricks, I drybrushed Model Color Foundation White (pic 6). The stones and the bricks were then given a wash of Model Color Wash Black in the recesses. To add some color I then added a few small clumps of green foliage. These were trimmed to shape with scissors (pic 7 and 8). I then drilled a hole into the bricks and friction mounted the figure. I’ll paint up the sides of the base, flat coat everything and gloss up the eyes again as the last steps but I’m essentially done. The box comes with a set of decals with a ton of choices of markings. 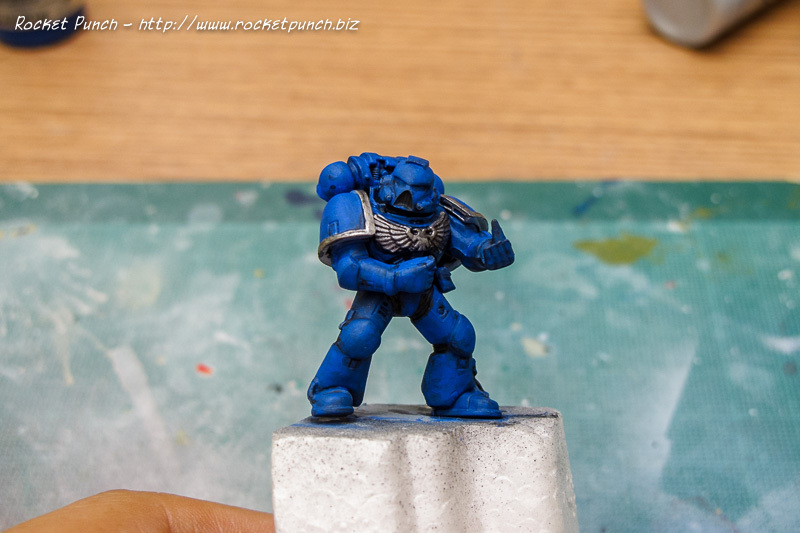 I decided to go with an arrow on the right shoulder and the Ultramarines insignia on the left. To prep for them I brushed on some Future. 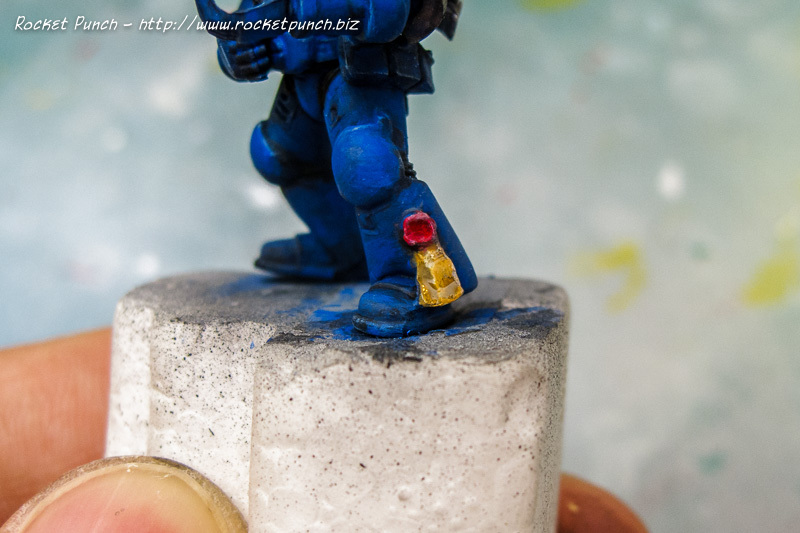 Meantime, I painted the Purity Seal with Transparent Red on top of Foundation White for the seal and Desert Yellow over Sand Light for the parchment. 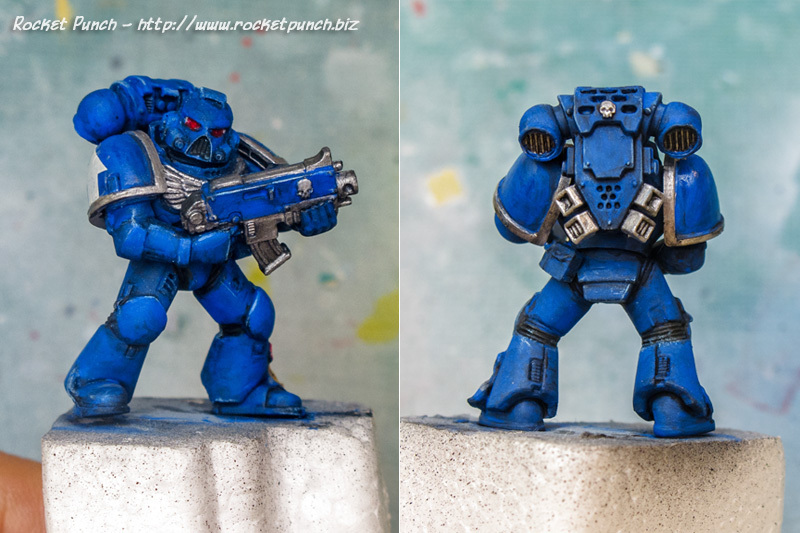 Both were given a Vallejo Model Wash Brown wash and drybrushed with Foundation White. Next I detailed the eyes with a spot of Foundation White in the corners to give an impression of reflection. 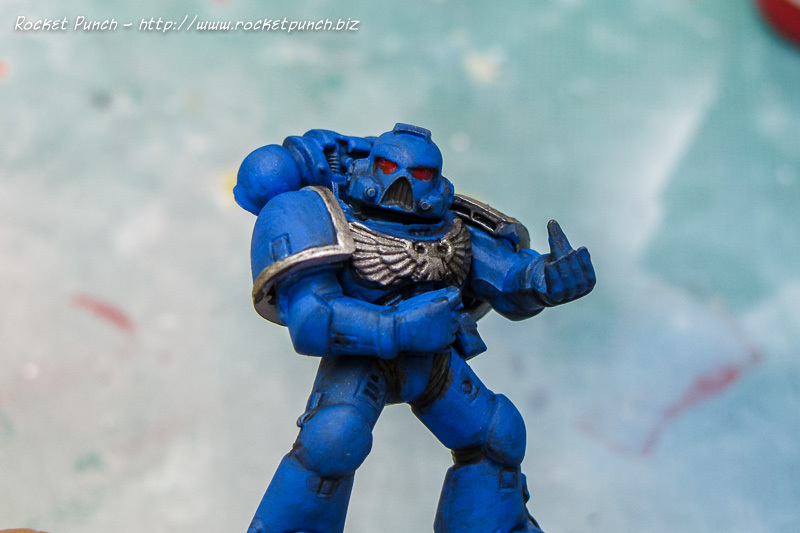 I also lightly painted the Aquila with Silver again to pop up the details. 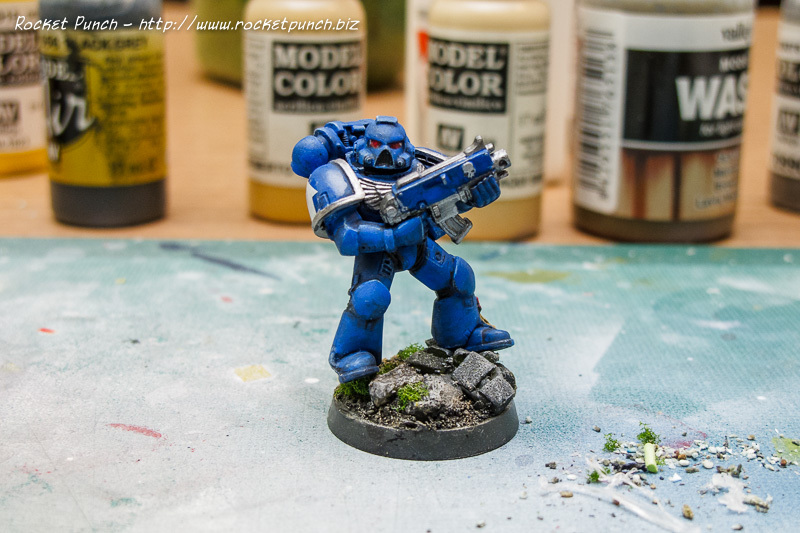 The Bolter was given the same treatment as the figure: a base color of Silver and Ultramarine, then a wash with Model Wash Black, then detailed painting with Ultramarine and Gunmetal Gray, then highlights with Sky Blue and Silver which were then toned down with a wash of Ultramarine and Gunmetal Gray. I then went back to the figure to do clean-up like around the eyes and to lessen some of the preshades on the limbs. I also decided to redo the highlights with Sky Blue. Then I put on the decals on the shoulders. They were surprisingly opaque but didn’t really want to conform around the curves of the shoulders so I had to brush on a few layers of Mark Softer along with using a sharp knife to cut the decals so they can conform better. 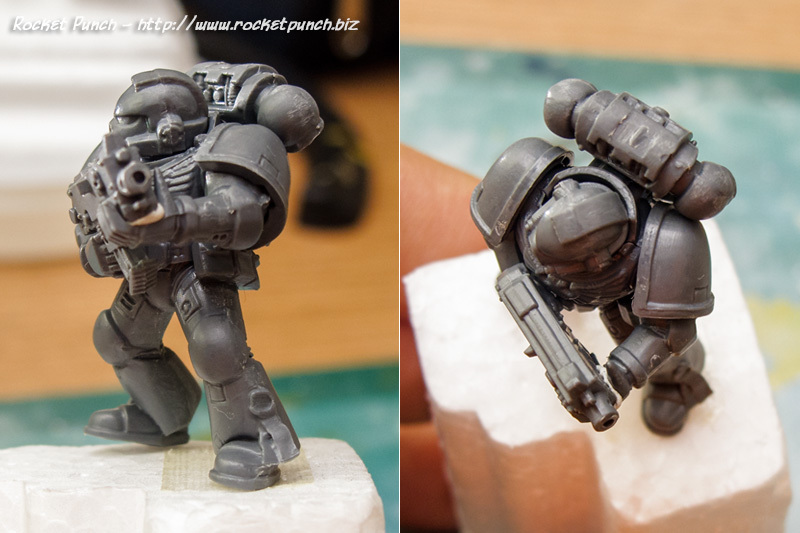 The last step was to then attach the Bolter. And I’m done with the figure! Doing up the base is next. 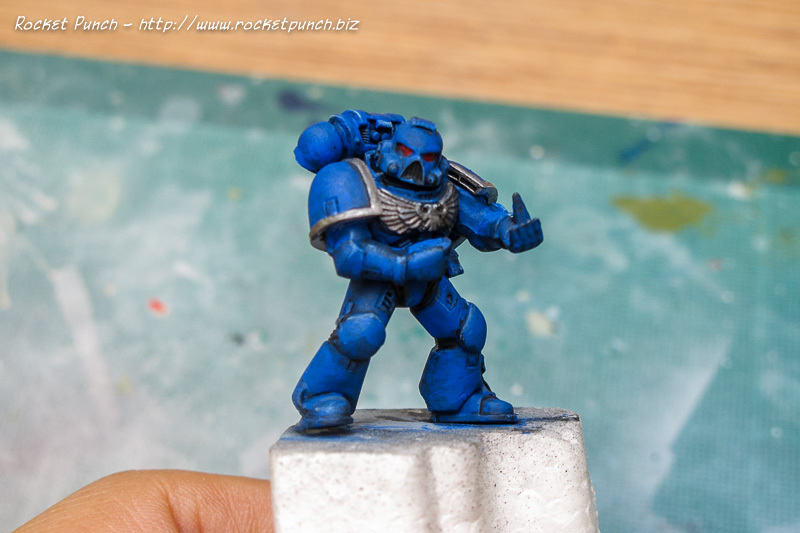 I decided to depict a Space Marine from the Ultramarines chapter which means an overall blue color scheme. Painting begins with a black undercoat. I’m using AK Interactive Black Primer for this. Then it’s spraying Vallejo Foundation White on the areas where logically would be the brightest. It’s also here that I fixed some of the seamlines and sprue cut marks. 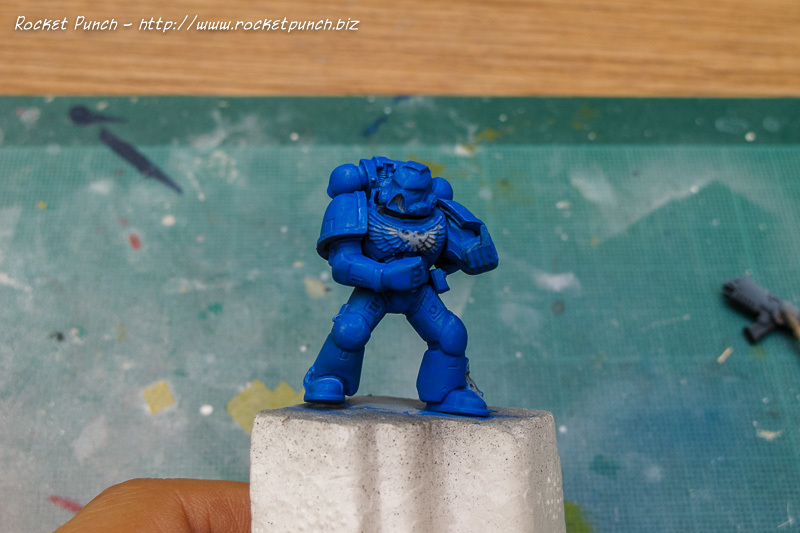 Then it’s a liberal coat of Vallejo Ultramarine over the whole figure. Taking care not to totally cover the black color in the crevices. The Aquila (eagle emblem) was left un-colored. Next is an overall thick wash with Vallejo Model Wash Dark Gray. 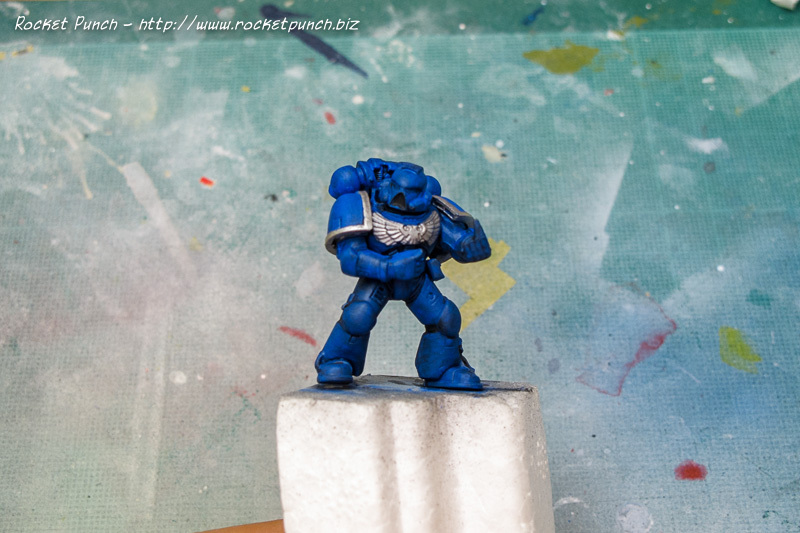 Then I go back in with Ultramarine, making sure I don’t paint into the corners so the wash is still visible. 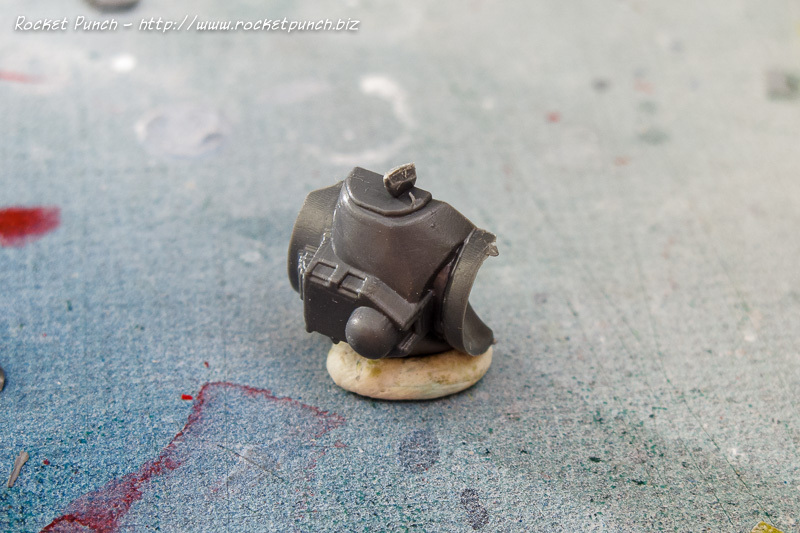 I then painted the shoulder armor and Aquila with Model Air Metal Silver. They should be gold color but my bottle of gold has split and can’t be used. It’s also at this point where I painted the mouth piece and joints with Vallejo Black Gray. Following that is another wash of dark gray over the silver and a much lighter wash into all the details on the figure. 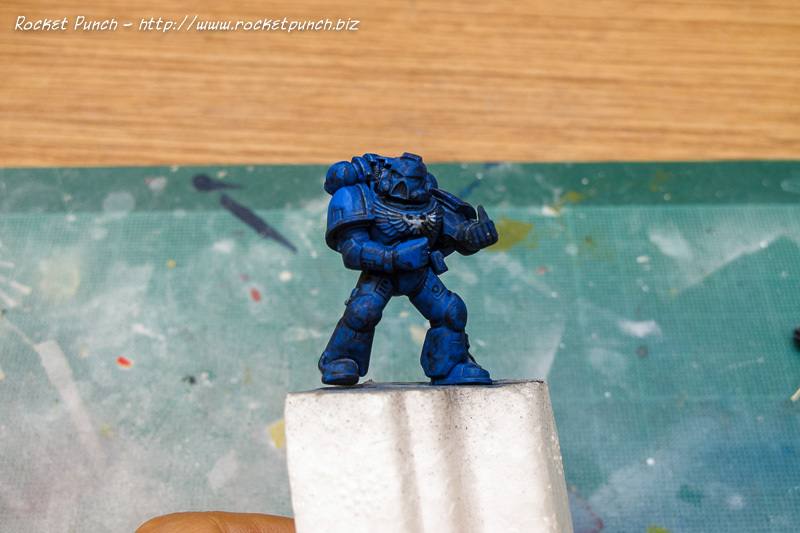 I touch up with ultramarine if the wash gets too heavy. For the eyes, I first painted Foundation White as a base and a few coats of Vallejo Transparent Red over them. Then it’s time for highlights. I first used Vallejo Sky Blue on the edges and then toned them down with another thin wash of black gray. The results are I think a bit too subtle but acceptable. 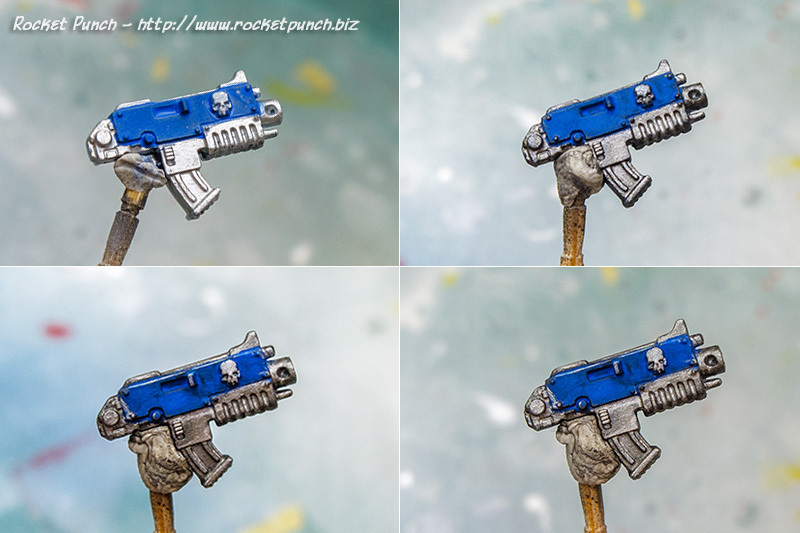 I also added some very subtle highlighting of the silver parts with white. So, a bit more detailed painting, decals, boltgun and the base next. So I decided I really should try my hand on some figure painting. 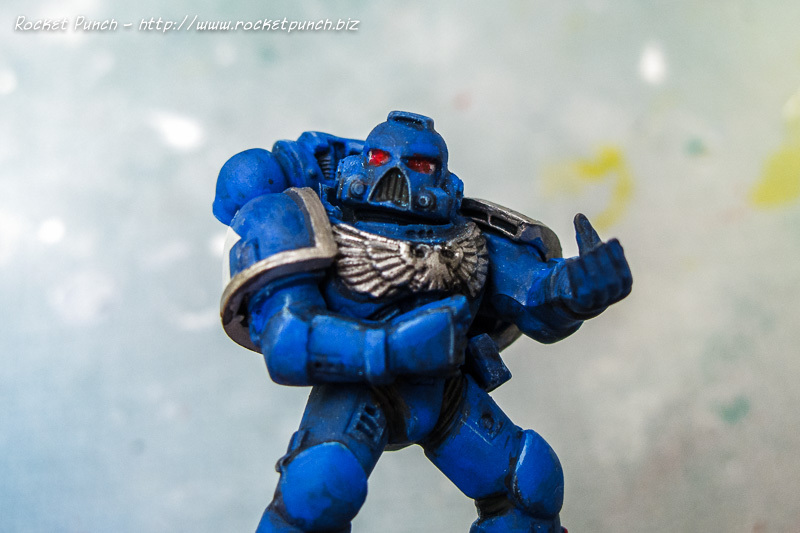 This is a Space Marine from Warhammer 40,000. As you can see there are 10 figures in 1 box so if I botch this one I can try try again. First up, I cut out all the parts needed to make up 1 figure. 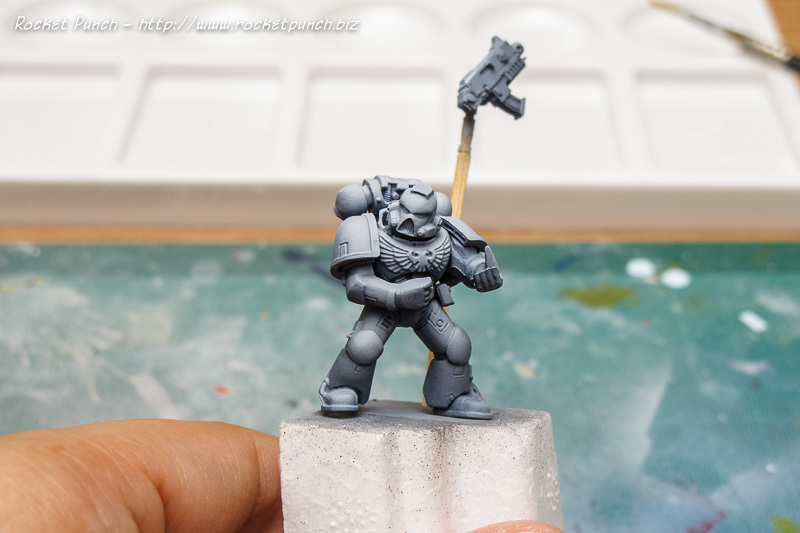 The box lets you customize your figure with various heads, weapons, accessories and arms but I decided to go with the simplest configuration: a typical Space Marine grunt armed with a basic Bolter. Quality-wise it’s actually not too bad. The details aren’t as fine as Tamigawa but I think for a boardgame piece that someone will handle roughly, this is very nicely done. 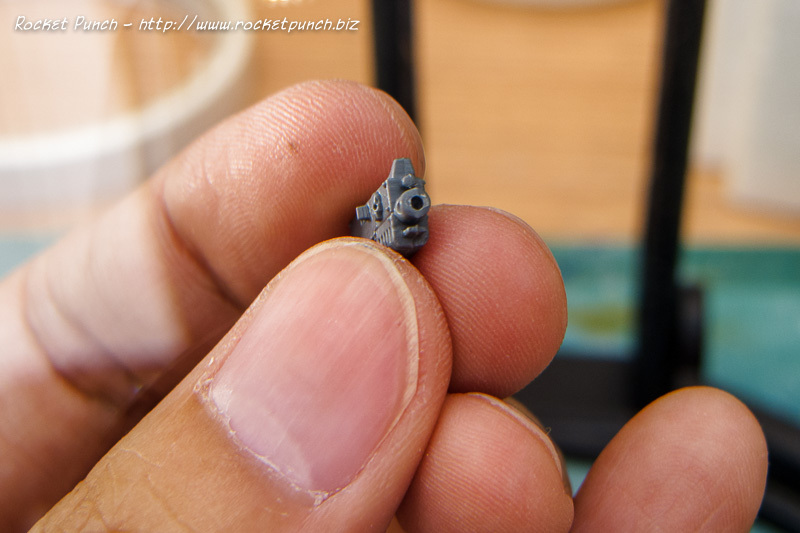 The sprue connections are a bit heavy handed but at least it’s easy enough to clean. 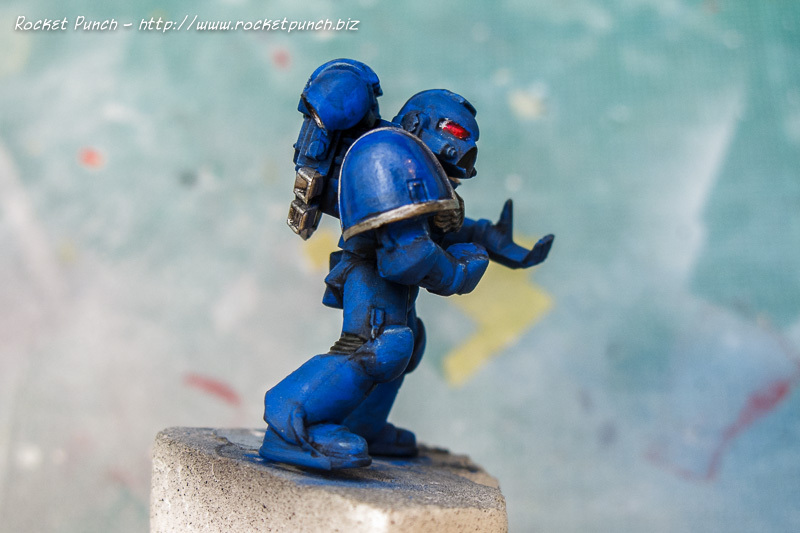 The Bolter comes with the pistol grip which needs to be removed and I left it unattached from the hands to make painting easier. The muzzle is blanked off at the tip so drilled a small hole on it to add a bit of detail. 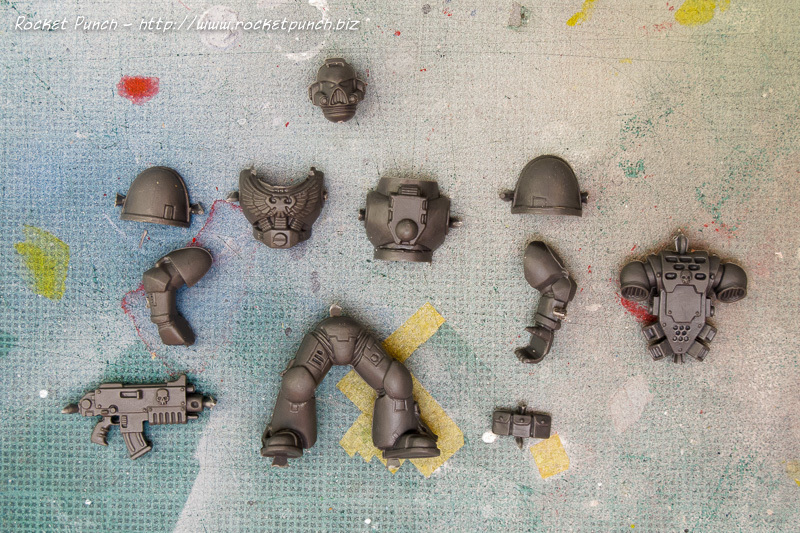 The rest of the Marine is cemented together and will be painted together. Clean-up of the mold lines was done by scraping them with my modeling knife and sanding with 320 and 1,000 grit sandpaper. And that’s it. Priming and rechecking for mold lines are next.